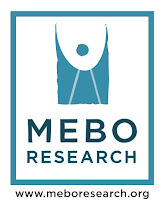 MEBO’s Scientific Director who has lead MEBO’s two exploratory clinical trials, Irene Gabashvili, PhD., has submitted a “use case” for the All of Us Research Program requesting research funding from the U.S. National Institutes of Health (NIH) for odor related conditions. If her request gets enough upvotes from our community around the world (anyone with IdeaScale, facebook, LinkedIn or google plus account could vote), we stand a chance to get funding for research into odor conditions. Anyone anywhere around the world could vote and comment! The deadline for submitting your vote and comments is February 23, 2018. Consideration for all entries will be discussed at the All of US Research Priorities Workshop on March 21–23, 2018, to identify key research priorities. As MEBO members, you can use MEBO's address information if necessary, including zip code 33175. ...led by the National Institutes of Health, and it aims to build one of the largest, most diverse datasets of its kind to help speed up research on many different health conditions. By presenting our case as being something out of the ordinary, a research topic not usually funded, we stand a chance to contribute to their quest for diversity. This could be our entry into a very narrow door to obtain research. 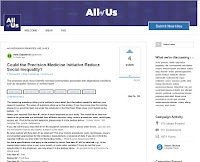 The All of US Research Program is led by the National Institutes of Health, and it aims to build one of the largest, most diverse datasets of its kind to help speed up research on many different health conditions. This could be our entry into a very narrow door to obtain research. By presenting our case as being something out of the ordinary, a research topic not usually funded, we stand a chance to contribute to their quest for diversity. We can present our case by addressing the needs of a significant part of humanity that is being forced into reclusion, out of mainstream society, i.e., classrooms, workplace, social gatherings, etc., and who are frequently and repeatedly bullied due to having an odor condition. if we present our case with provoking short descriptions of living with an odor condition, we may hopefully have an impact and we might get access to research resources. Make sure you click on the ‘Votes’ arrow in addition to writing your comment. Your comment can be submitted anonymously. This program aims to fund genomic/microbiome sequencing and metabolome studies of wide population; if we present our case with provoking short descriptions of living with an odor condition, we may hopefully have an impact and we might get access to research resources. You can submit your own idea at this site (it can't be anonymous though) by creating an account and casting your vote. If we support it by writing a comment as to why research into odor related conditions, Irene says that she would be happy to upvote it. They only ask for your email address and name. Please click on the link below and write your comment. This research project proposed by Dr. Irene Gabashvili, would be the only current study aimed at helping a significant part of humanity around the world that sufferers from uncontrollable body odor condition due to a medical cause that requires much more research to understand and manage. This condition forces sufferers into total reclusion due to being rejected by society. The sufferer is not welcomed in a classroom setting, employment setting, and intimate relationships are very difficult to come by because the uncontrollable odor pushes potential prospects away. This condition frequently leads to bullying and abuse, resulting in deep psychological injury. Please fund this research project, as it has proven through the years to be impossible to obtain funding from private sources. Our MEBO Community around the world is most grateful to Irene Gabashvili for having been a very valuable part of the MEBO Directorship since the establishment of the Charity in 2009, by carrying out two clinical trials for us without compensation for her work, and by doing numerous presentations found in this blog. Irene has always made herself available to us for consultation, and her guidance has been invaluable! “All of Us Wants Your Ideas! With your help, we can ask important questions that will improve our nation’s health. So, what are we asking from you? We want you to tell us what unique research questions you think All of Us could address. Your input will be considered at a Research Priorities Workshop in March 2018 and ultimately help us build out the All of Us research platform with the tools needed to answer those questions. If you don’t already have an account with IdeaScale, creating one is easy! Sign up using your email address and a password by clicking "Register" in the upper right-hand corner. To submit your idea or to see the ideas others have already submitted, click the “All of Us Research Priorities Workshop Use Cases” box below. Please submit your ideas by February 23, 2018.